On Saturday morning I felt let down, a little sorry for myself, and that what I was doing was a waste of time. 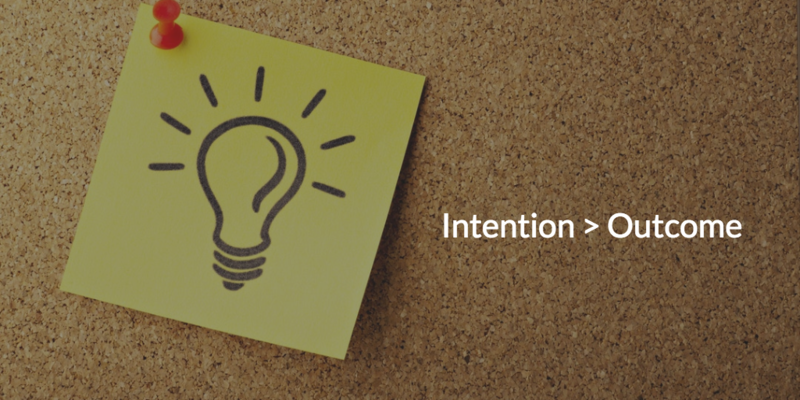 In other words, I forgot the equation: Intention > Outcome. It was Week Four Team’s turn to facilitate the Waking Up Meditation Community on Meetup.com. Team responsibilities include setting up chairs and cushions, timing three meditation periods by ringing a bell, choosing a topic for discussion, and bringing snacks for the informal social time that follows. To assure that these basic intentions are carried out, the team lead (me) touches base with the other two members by email to confirm that they’ll be there to do their part. If they’re unable to show up, it’s their job to find a replacement. When I arrived on Saturday to find that no one was there to help set up, I felt let down. Setting up the chairs and cushions was not too big a task to accomplish on my own but as I went about it, I felt a little sorry for myself. As 9:00 a.m. rolled around, there was no one there to meditate. I rang the bell at 9:00 a.m. to start my own meditation practice. “I’m here to meditate,” I said. She smiled and said, “Let’s do it.” She went and sat on a cushion. I rang the bell and re-started the meditation period. At 9:50 a.m. I rang the bell to signal the end of meditation. I looked out and saw three people sitting with eyes closed in the sunroom outside the hall. I went out to quietly say hello so as not to startle them. They opened their eyes one by one. One woman looked particularly surprised, as if she’d just awakened from a deep sleep. “Would you like to have a discussion?” I asked. That was the next item on the agenda. We agreed to go into the meditation hall and sit in a circle as we usually did. I asked what they’d like to discuss. The woman who’d arrived at 9:01 suggested the topic I’d prepared and posted on Meetup.com. We proceeded with the discussion. In the end, one other person took advantage of my effort to set up the chairs and cushions. Four other people participated in the discussion. One of them thanked me for sharing the topic. The team member responsible for snacks came through, so we had some coffee cake afterward. But, the most important outcome for me was the reminder of why expectations are problematic. Practicing acceptance is one way to cope with unpleasant feelings when situations fail to meet our expectations. Focusing on intention is another. The most stressful things we deal with in life are the illusion that we are in control and our reactions when we’re reminded that we’re not. What makes focusing on intentions so much more valuable than focusing on outcomes is that our intentions are actually within our control while outcomes involving other people always depend on things we’re not. Following through on our intentions allows us to feel positive about our efforts no matter what the outcome. The intention behind setting up the chairs is to provide people who choose to participate in meditation an environment conducive for doing so. I didn’t accomplish this in the way I expected, but I followed through. The intention behind leading a discussion is to explore how our meditation practice can benefit our everyday lives. Though I couldn’t control how many people participated or what they would take away from the discussion, I followed through in providing a topic. 1. Take a moment to peruse the list of depression symptoms or well-being strategies. 2. Choose a symptom or strategy you would like to work on. 3. Schedule a reminder to set aside ten minutes to work on that symptom or strategy within the next twenty-four hours. 4. When you’re reminded to do so, spend ten minutes following through on your intention. Next Next post: Self-Compassion or Self-Sabotage?